Prominent & Leading Exporter from Ambala, we offer lensometer. Medical Lensometer Corona Cross Target combines an excellent ocular type external reading system with very clear target screen. It is same as Lensmeter Corona Target but with a slight difference with Pinhole Cross + Corona Target. 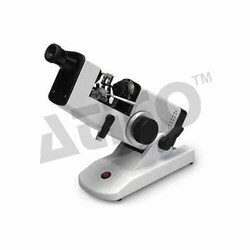 Also, the instrument can be moved from 30° to 90° with High Power Magnification for getting sharp and bright corona focus. Cordless operation and less power consumption. Compact, light weight and handy instrument. Simple and easy, scale reading system. Looking for OPD Equipment ?